When you save a message as HTML in Outlook 2007 and newer, Outlook creates a matching (and annoying) folder containing XML and THMX files, as seen in the screenshot below. Besides the issue that Outlook is cluttering up the drive and wasting space (although the files total 6 KB, so its not a lot of waste), deleting the folder also deletes the HTML page. Moving or copying the HTML file copies the folder. This is because the default setting for managing web pages and folders is to set to manage them as a single file. If you want to change the settings, you'll need use the manage pairs registry hack to make the option visible. This hack will work with Windows 10 and all supported Windows operating systems. It will work with Windows 10 64-bit and Outlook 2016 32 or 64-bit. After setting the registry key, you'll need to open Windows File Explorer's Folder Options dialog to change how the folders are managed. In Windows 8 or 10, click to expand the Options button on the right side of the View tab. Select Change Folder and search options from the menu to open the Folder Options dialog. On the View tab, change the Managing pairs of Web pages and folders setting to Show both parts and manage them individually. Now you can delete the folder without deleting the HTML file too. In Windows XP, Folder Options is on the Tools menu. 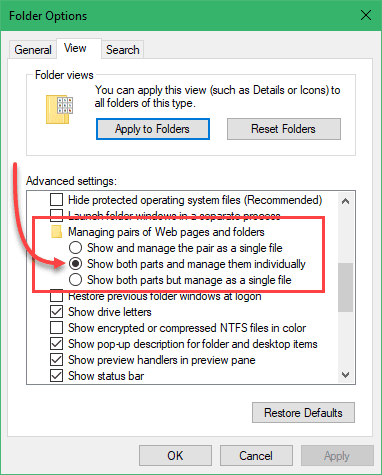 In Vista and Windows 7, go to Organize, Folder and Search options. I've updated the article for windows 10 - the fix is identical for all windows versions- set the reg key. I'd like to know how to delete that annoying list of purchase possibilities on the Outlook home page and also how to log out? The list prevents me from reading messages without scrolling back and forth. Gmail, here I come!!! This is at outlook.com? I'm not sure list you are seeing - I don't see it when I log into my account.